Forty years of frustration boiled over in that letter. Gilbert is from Detroit, but perhaps that's why he too shares these feelings so viscerally. James' departure also fits the narrative of generalized anxiety around “brain drain” and cities losing their best and brightest of each generation. As lots of people really have left Cleveland, this is understandable. But the real story is much more complex. A look at IRS tax return data shows that in reality Cleveland doesn't have especially high out-migration. Its metro out-migration rate* in 2008 was 28.02. Miami's was 40.34 and for even the boomtown of Atlanta it was 38.95. Not only is Cleveland not losing an especially high number of people, you can actually argue it is losing too few. A big part of the problem in Cleveland's economy is that too many people are stuck there. Conversely, a real migration problem is that too few people are moving in. As local attorney Richard Herman noted, “New York City and Chicago, like most major cities, see significant out-migration of their existing residents each year. What is atypical is that Cleveland does not enjoy the energy of new people moving in.” The Cleveland metro in-migration rate was only 22.19. Miami's was 30.36 and Atlanta's a robust 51.91. Cities need new blood. Cleveland isn't getting it. Its circulatory system is shut down. Cleveland needs more natives to leave and more newcomers to arrive. Both sides win. Those Cleveland departees will move on to be part of the new energy other cities so desperately need. James is going to get to live the high life he wants in South Beach, but somebody else will be fired up to get the opportunity to play in Cleveland. But that begs the question, what's going to get more people to move to Cleveland? The fact is, James wasn't getting the job done, and never would. Nor will amenities like the Cleveland Orchestra or the Rock and Roll Hall of Fame Museum. The mistake Cleveland and other Rust Belt cities make is that they are too worried about the likes of LeBron James moving to Miami. For people with the means and the desire to choose a place like South Beach, Cleveland simply can't compete. And let's not forget, James snubbed Chicago, New York, and Los Angeles too. I think that troubled cities often tragically misinterpret what's coolest about themselves. They scramble for cure-alls, something that will "attract business", always one convention center, one pedestrian mall or restaurant district away from revival. They miss their biggest, best and probably most marketable asset: their unique and slightly off-center character....Cleveland is one of my favorite cities. I don't arrive there with a smile on my face every time because of the Cleveland Philharmonic. Who is going to get that message out about Cleveland? After that sendoff, it sure won't be LeBron James. That's a shame. As Jim Russell has richly illustrated, people make migration – and investment – decisions based on knowledge, not just information. Nobody picks a city to live in by entering reams to statistics into a sixteen tab spreadsheet. They're more likely to move to be near family, friends, or places they know. That knowledge comes from first hand experience – and trusted recommendations. Until the switch flips on Cleveland's brand, it needs to be out earning that trust of prospective residents. The people who've left aren't Judases, they're your field sales force – or at least they should be. James could have been a missionary “Witness” for Cleveland in a foreign land. 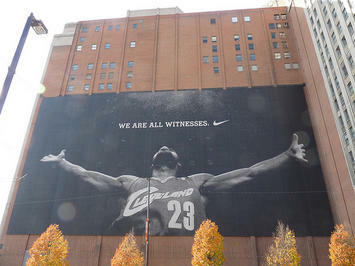 Instead, Cleveland blew an enormous opportunity, and left itself with little more than soured memories and a partially demolished mural as an ephemeral reminder of yet another failed Next Big Thing. Submitted by xygwfl1122 on Wed, 01/21/2015 - 07:42. Submitted by xygwfl1122 on Tue, 01/20/2015 - 05:16. Submitted by robert1122 on Sun, 09/01/2013 - 08:04. Submitted by zion1122 on Sun, 08/04/2013 - 22:47. With a river on fire, who wants to live in Cleveland ??? Submitted by davebarnes on Thu, 07/15/2010 - 21:44. But, Cleveland needs to recognize that its single claim to fame (in my lifetime) is the river on flames.